I am out of town for the day and so I am having a guest blogger fill in for me. I hope you all give Thorsten Knublauch a warm MTBFR welcome! 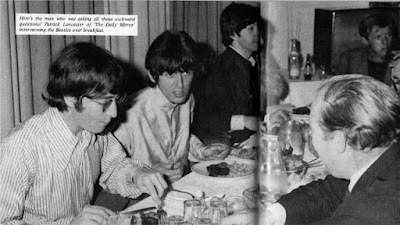 Thorsten is a long time friend of this site and has written several books about the Beatles, including one that I really enjoy about the Beatles German tour in 1966. Thanks, Thorsten for sharing with us while I am out of town! 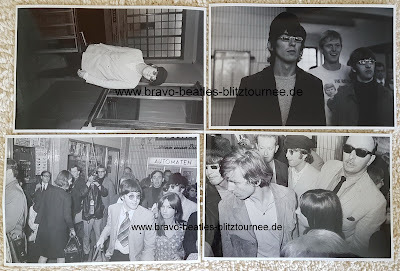 Peace and Love -- Sara S.
The Beatles arrival for their Hamburg concerts during their German “Bravo-Beatles-Blitztournee” at a small suburb station in Ahrensburg on June 26th 1966, a few miles outside Hamburg, is probably my favourite Beatles “event” ever. The Beatles traveled by special train from their concerts in Munich to Essen (actually to the station in Mülheim near Essen) and overnight to Hamburg. Having played two shows in Munich on June 24th, they were starting on June 25th at around 8.15 a.m. to arrive in Mülheim around 4.30 pm to play to shows in Essen. After leaving at midnight they arrived in Ahrensburg around 5.30 a.m. The train stations were “secret” to avoid any trouble, but even the arrival in Mülheim brought at least 1.000 fans to the gates. Someone leaked the police plan to the press. The arrival in Ahrensburg was more secret and probably only a rumor among the fans but a few hundred fans were also there around the station and very few fans and several press were on the platform. Also on the platform were some former friends from their Hamburg days club days as Bettina Derlien and Hans-Walter “Icke” Braun. The security was nearly nonexistent. Only a few police officers and the Beatles entourage of Neil Aspinall, Tony Barrow, Alf Bicknall, and Robert Whitaker where on hand to protect the safe departure. 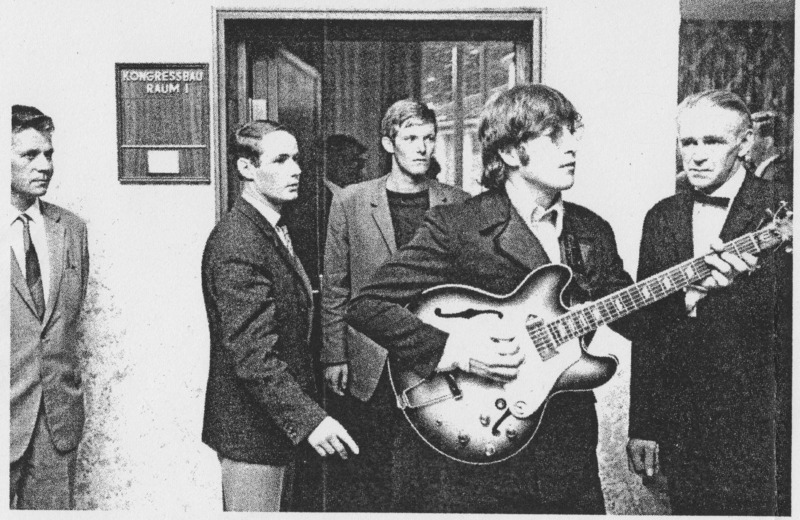 As seen on the footage and photos, the Beatles had to run from the train to the entrance hall, talked for some minutes to the fans and friends and then had to run out of the hall down the small stairs through the waiting fans inside their car and off they went to their castle hotel in a little village nearby called Tremsbüttel. I always liked the scene and the photos and still wonder how on earth this happened like this. What could have happened....? When I heard that my favorite photos came on the market I bought the negatives with copyright and an unpublished one to my collection of negatives from the tour. I`d like to present my most favorite photo of that morning and probably my most favorite picture of the tour. 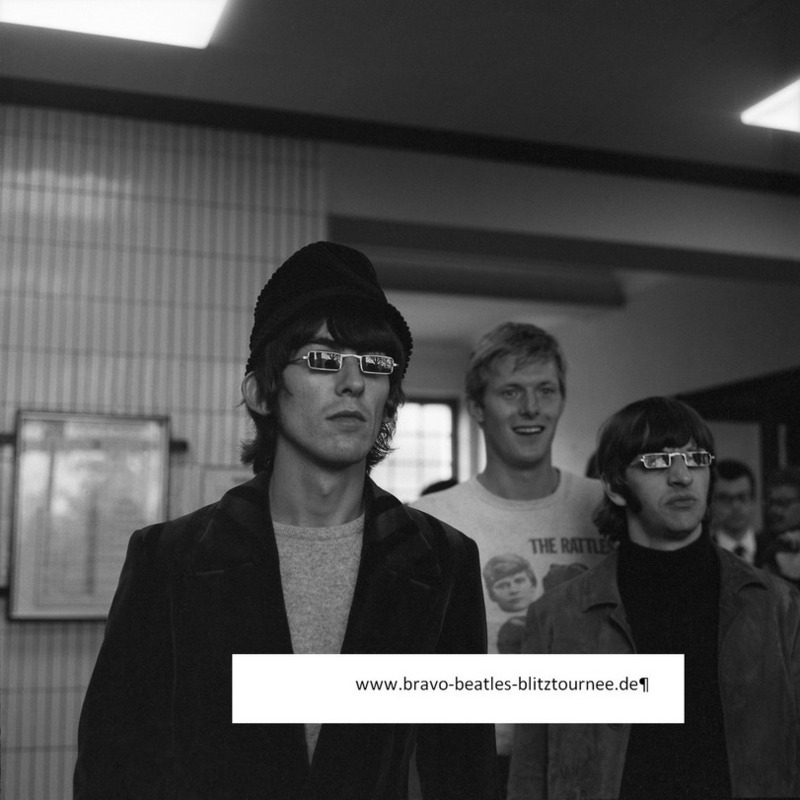 It shows George and Ringo carrying their small suitcases and wearing their cool 1966 sunglasses being “photobombed” by a fan they knew a bit from their Hamburg days in the early Sixties. He is called Jochen von Bredow, was at the time a journalist, and could be seen in between George and Ringo wearing a sweater with a picture of the support group of the tour a German band called “The Rattles” from Hamburg. How cool is that…? 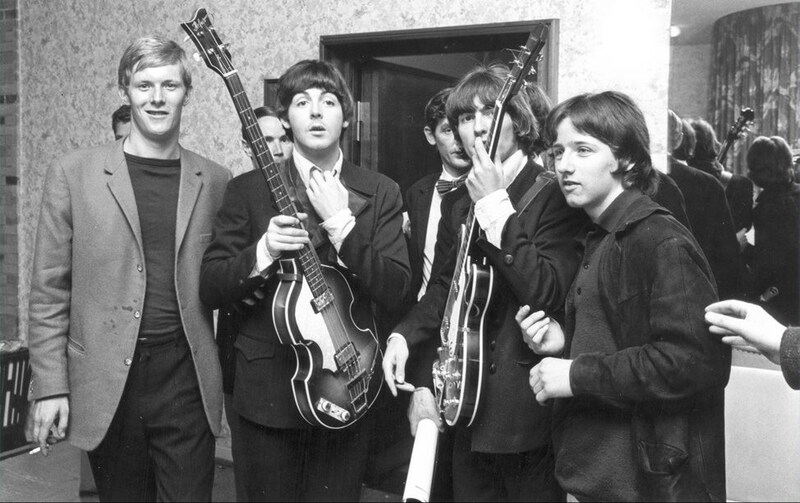 I love the impression on the Beatles faces. 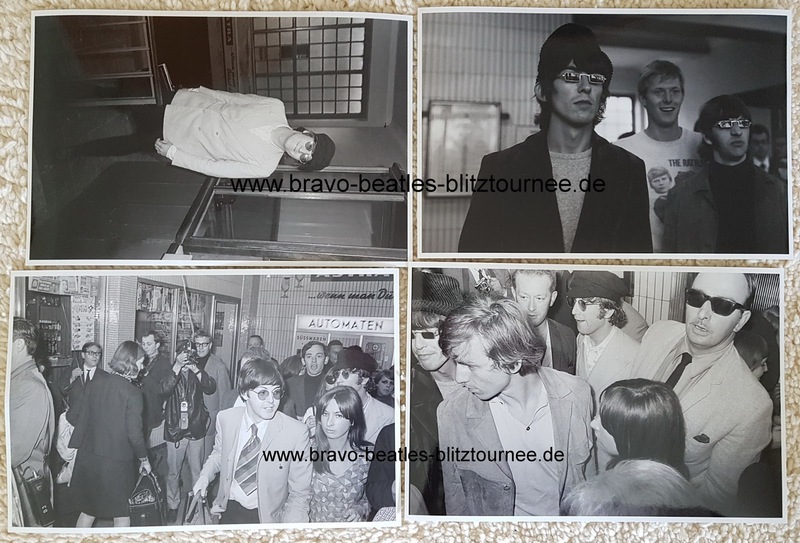 In between the two shows in Hamburg, Jochen von Bredow and many other friends from the old days managed to visit the Beatles backstage and can be seen on several photos where I show a few here. If you are interested in the full story please check my video: https://www.youtube.com/watch?v=mfbkCP9HCvM. 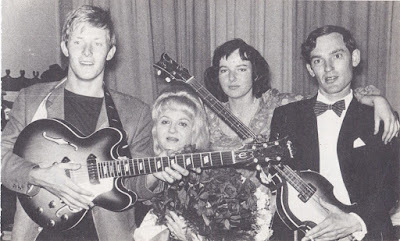 There are several pics of them both - one where he played guitar to her.